Dual-Zone Heated Cargo Pants | OhGizmo! By Andrew Liszewski on 11/22/06 • Leave a comment! Even though I’m a big Nintendo fan I will admit that Sunday morning I was less than happy the company had chosen the month of November to launch the Wii. While multiple layers of clothing made things more bearable I would really have preferred to be sporting a pair of these that day. 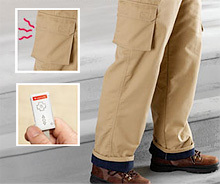 The Dual-Zone Heated Cargos are available from Brookstone for $150. ← Signal Sorcerer – Why Wait For A Green Light?